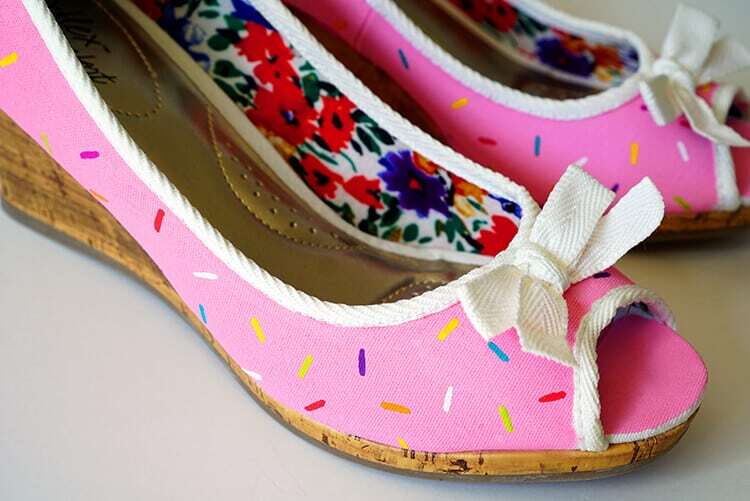 I took my love for donuts to the next level with these adorable and incredible hand painted pink sprinkled donut shoes! 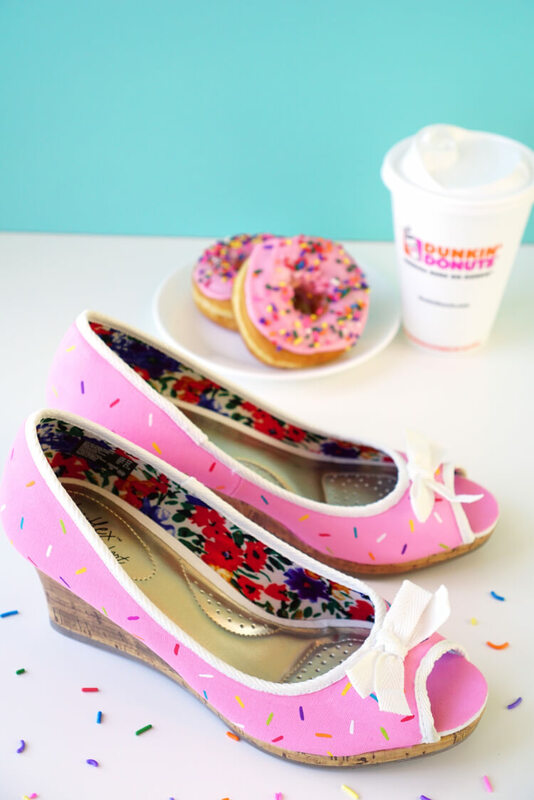 The perfect trendy accessory for any fashionable donut lover! 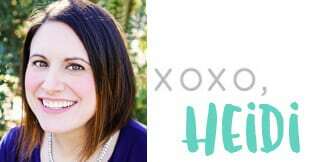 You guys probably already know how I feel about donuts since I’ve shouted my deep and undying love from the rooftops on many occasions (remember my DIY donut charm bracelet, donut soap, and printable donut thank you notes…along with my numerous donut recipes?). Seriously, donuts are a BIG deal around here, and fall flavored donuts are the biggest deal ever! Dunkin’ Donuts opened their first store in our area just one year ago today, and the boys and I are already hooked! We didn’t discover the deliciousness of Dunkin’ until after the holidays last year, so we were beyond excited to get our hands on some of their seasonal fall flavors this year. Did you know that Dunkin’ Donuts offers one of the larges varieties of pumpkin flavored choices of any national restaurant? AND they’re available all day long (just like their entire breakfast menu!)! 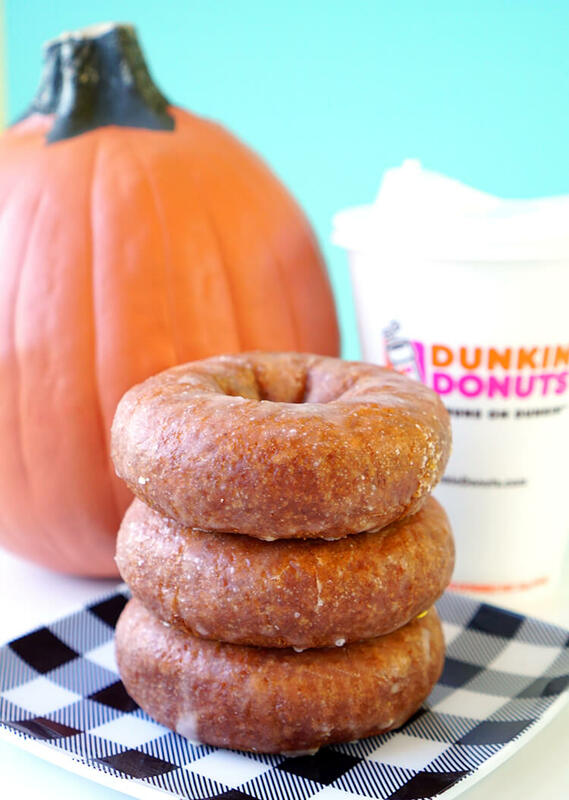 All-day breakfast is my favorite, and that means that you can get your hands on these delicious spiced glazed pumpkin donuts (in regular or bite-sized MUNCHKINS donut holes) whenever you want! Score! Dunkin’ Donuts is also serving up a winner with this innovative Caramel Apple Croissant Donut. 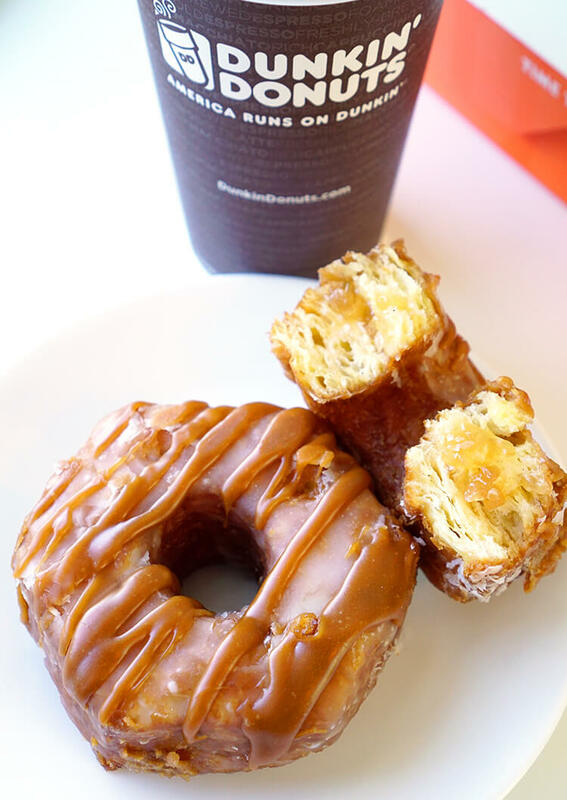 Have you ever eaten a croissant donut before? It’s a total game changer! Flaky layers of croissant are stuffed with apple filling, glazed, and topped with a silky caramel drizzle. Yeah, it’s all kinds of amazing! When you pair it with a Dunkin’ Donuts Pumpkin Macchiato (an espresso drink with layers of steamed milk and a pumpkin flavored swirl – YUM! ), it’s seriously to die for! If you sadly don’t have a Dunkin’ Donuts in your area, you can purchase pumpkin flavored K-Cups and packaged pumpkin flavored coffee online, so you’ll always have that awesome fall flavor right at your fingertips. 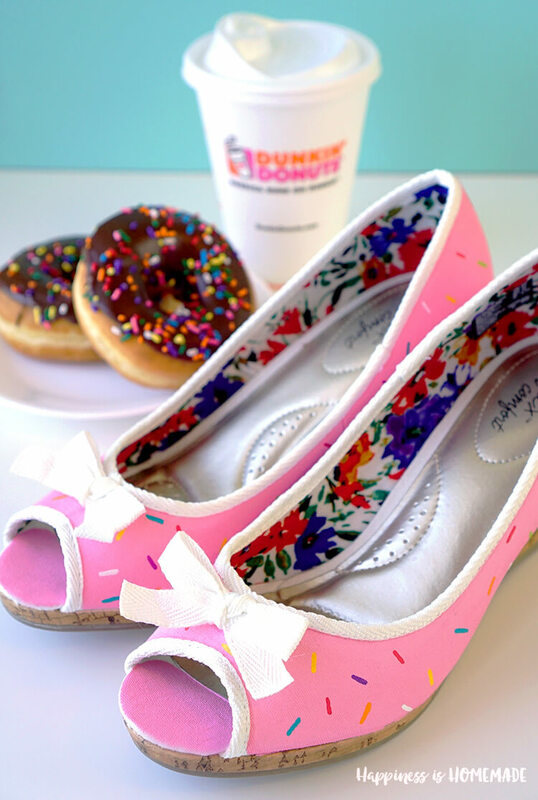 I’m crushing hard on Dunkin’ Donuts, and as I was sitting in the donut shop, admiring this perfect sprinkled donut specimen, it hit me – I NEEDED to make a pair of sprinkled donut shoes to show off my donut love! Sounds totally logical, right? 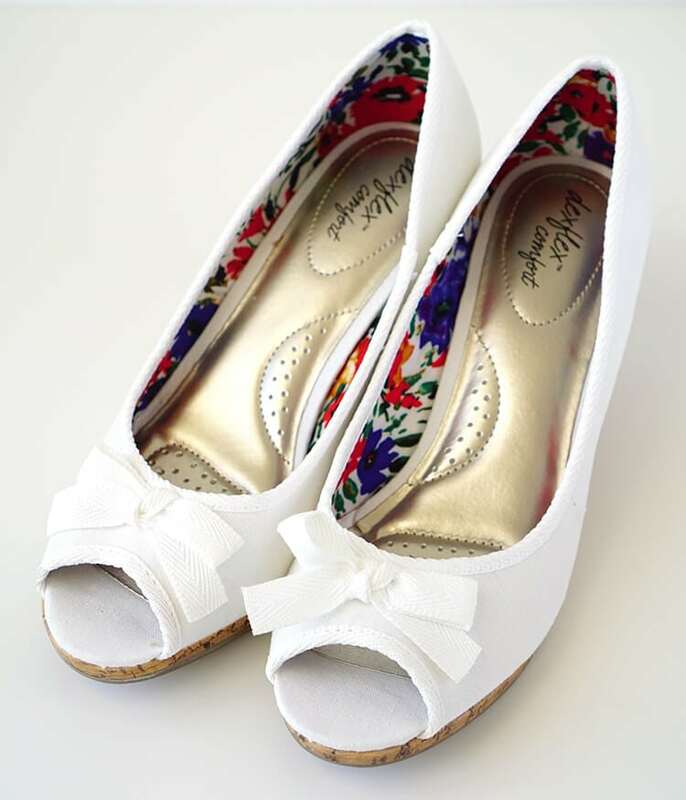 I’ve had this pair of white canvas wedges sitting in my closet for over a year, just waiting for inspiration to strike. I picked them up on sale at the end of last summer because I knew they’d eventually be the perfect canvas for something awesome (spoiler alert: I was totally right!). I started by painting the shoes “donut pink” with a mixture of acrylic paint and fabric medium. I covered the bows up with washi tape to avoid getting any paint on them, and I left the trim of the shoes white. Once the pink paint was dry, it was time for the fun part – adding all of the sprinkles! Using a tiny paintbrush, I added sprinkles in a rainbow of colors to the shoes. I decided to go for moderate sprinkle coverage, but a part of me still wants to go back and add even more sprinkles. 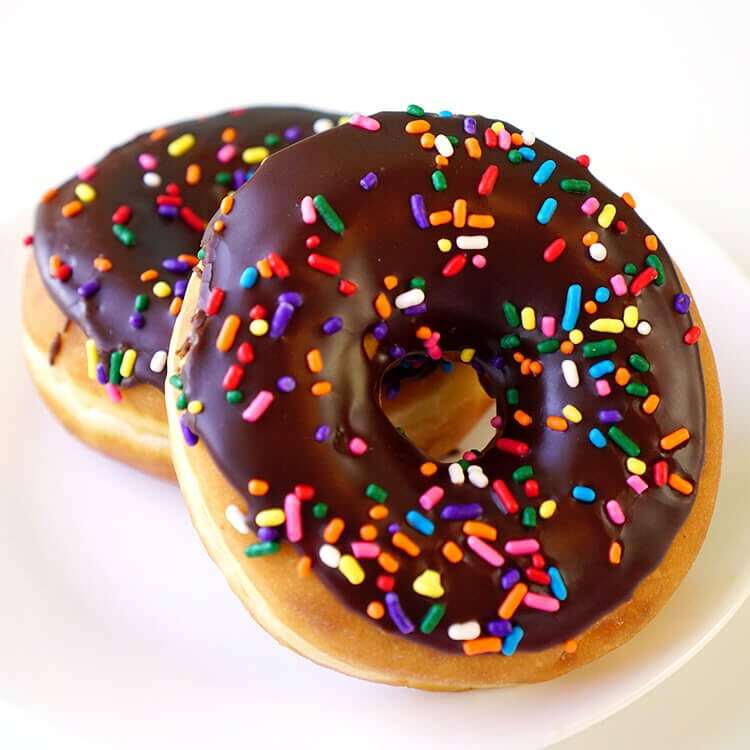 What do you think – more sprinkles or are they good as-is? Now I can show the world just how much I love donuts (and all things sprinkled!) everywhere I go! 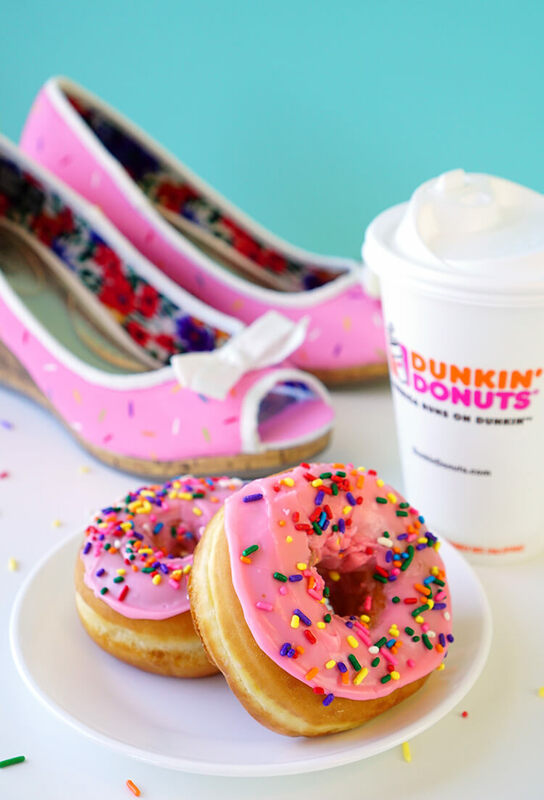 I will most definitely be wearing my sprinkled donut shoes the next time that I stop into Dunkin’ Donuts for these pink sprinkled beauties! 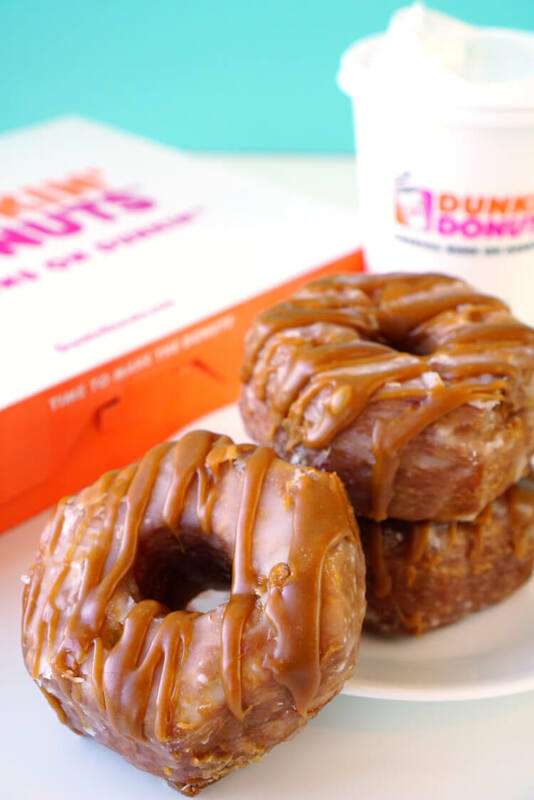 Want to try the new Caramel Apple Croissant Donut for yourself? 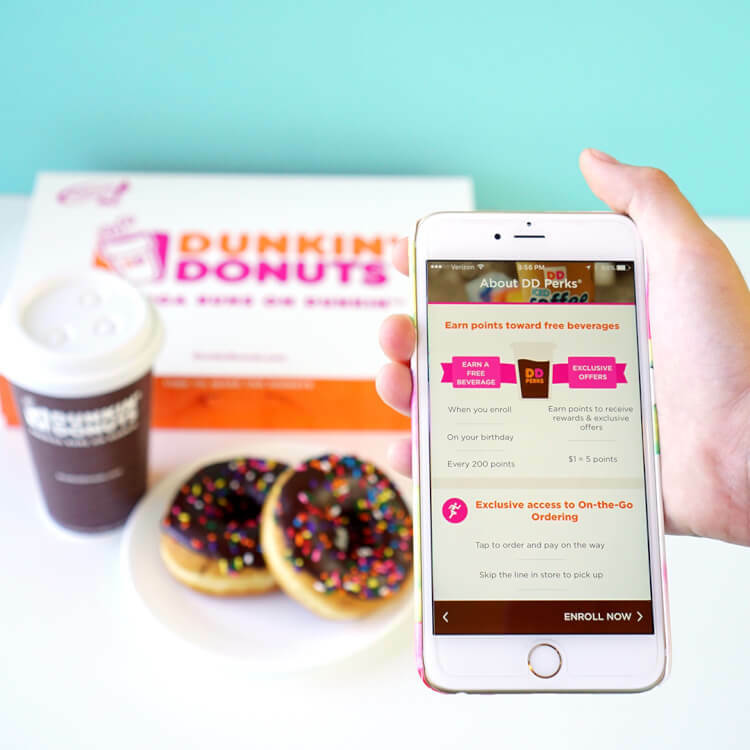 Enter via the Rafflecopter below to win a $25 Dunkin’ Donuts mGift card! 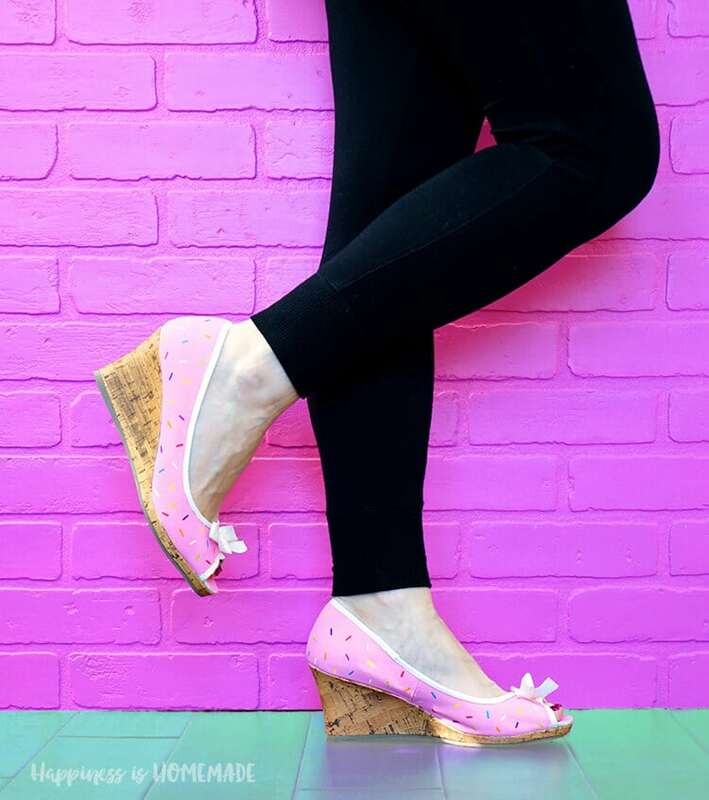 If you like these sprinkled shoes, don’t forget to pin them!